Fiddler et chef d'orchestre US né le 25 Avril 1915 à Texas City (Texas). Cliff Bruner est décédé le 25 Août 2000. In the late '30s, during the classic era of Western swing, Cliff Bruner was one of the fiddlers who helped to create and develop that music by fusing country and jazz sounds. As the bandleader of his own Texas Wanderers, Bruner carved out a place in country music history by focusing on a new kind of song — not the smooth, heavily jazz-influenced arrangements to which other Texas bands of the day aspired, but simpler Vocals pieces with lyrics that spoke of disillusionment and hard luck. Bruner is particularly noted for his recording of Ted Daffan's composition "Truck Driver's Blues" — the first trucker song ever committed to disc. Born in Houston, TX, in 1915, Bruner was performing professionally and wandering around Texas in search of gigs by the late 1920s. The medicine show provided him with early employment, as it did for many other early country stars; he had signed on with Dr. Scott's Medicine Show, a traveling caravan hawking a cure-all called Liquidine Tonic. In 1934, Bruner joined the pathbreaking Western swing band Milton Brown & His Musical Brownies, an act which billed itself as "The Greatest String Band on Earth." He cut close to 50 songs with the group before Brown was killed in an auto accident in April 1936; the twin fiddles often heard in the Brownies' music (setting a pattern that lasted for decades in country music) are those of Bruner and the classically trained violinist Cecil Brower. 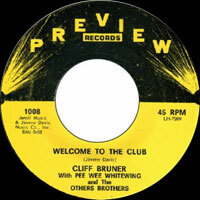 After Brown's death, Bruner returned to Houston and formed a group called the Texas Wanderers (sometimes called Cliff Bruner & His Boys). The band settled into a slot on Beaumont radio station KDFM, whose listenership crossed the state line into heavily Cajun Southwestern Louisiana. As did other Western swing bands, this one fused traditional fiddle-led country music with elements of 1920s and '30s pop and jazz. But Bruner, from the start, favored a strikingly contemporary sound. He brought the wildly experimental electric steel guitarist Bob Dunn on board from the Brownies and featured an electric mandolinist, Leo Raley, and an energetic barrelhouse pianist, Moon Mullican. The Texas Wanderers' recordings on the Decca label crowded jukeboxes along the oil-rich, heavily industrialized Texas Gulf Coast. Among the many songs featuring Vocalsist Dickie McBride were several that were recognized in retrospect as early classics of the honky tonk genre: the band had perhaps its biggest hit in 1938 with a recording of the Floyd Tillman composition "It Makes No Difference Now" and "Truck Driver's Blues" followed in 1939. 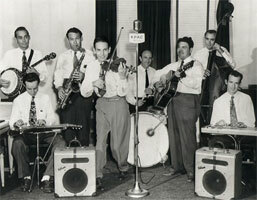 In the early '40s, Bruner dissolved the Texas Wanderers, but he continued to work with Mullican and with other musicians who were forging modern country music out of the forms of Western swing: he performed with former Texas governor W. Lee O'Daniel and with Louisiana governor-to-be Jimmie Davis. Bruner and Mullican headed a band called the Showboys, and he made some recordings for Mercury and for small Texas labels after World War II. Bruner largely dropped out of music in the early '50s in favor of an insurance-sales career. When the Western swing revival flowered in the 1970s, however, he gained proper recognition as an enormously influential figure. He appeared on Johnny Gimble's 1980 LP Texas Swing Pioneers and remained active as a performer well into his ninth decade. On August 25, 2000, Bruner's long lifetime of making music came to an end when he died of cancer at the age of 85. 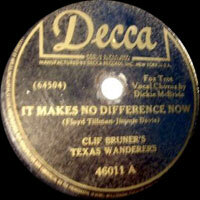 09/1939 78 t. DECCA 5719 (US) Cliff BRUNER'S TEXAS WANDERERS - I Still Care For You / Is This A Dream? 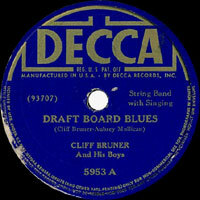 1947 78 t. DECCA 46043 (US) Cliff BRUNER - If It's Wrong To Love You / ? 1977 LP 12" MCA VIM 4016 (US) CLIFF BRUNER & THE RICE BROTHERS BAND - Bringing Home The Bacon / Corrine, Corrina / Under The Silvery Moon / Odl-Fashioned Love / Beaumont Rag / San Antonio Rose / I'll Forgive You, But I Can't Forget / King Cotton Stomp / Sugar Blues / On The Sunny Side Of The Street / When I'm Walking With My Sweetness / Alabama Jubilee / You Are My Sunshine / Is It True What They Say About Dixie?